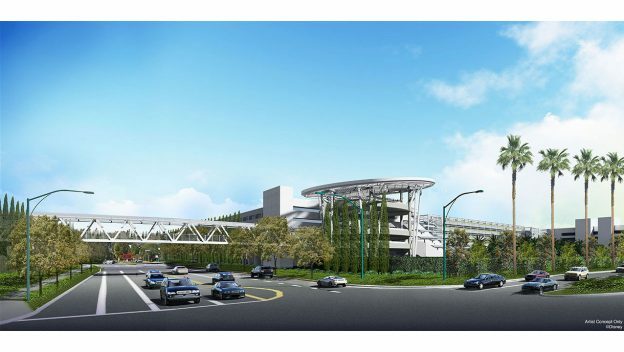 A new 6,500-space parking structure is currently under construction near the Mickey & Friends structure at the Disneyland Resort. It will also feature a new pedestrian bridge over Magic Way. This new bridge will connect visitors from the parking structure—over Magic Way— to the rest of the resort, allowing guests the option to stroll through the Downtown Disney District to the theme parks’ Main Entrance. In addition, the new bridge eliminates the foot traffic crossing the street at Disneyland Drive and Magic Way, providing not only convenience, but also greater pedestrian safety and better traffic circulation. Set to be completed next year, these parking and transportation enhancements—along with other existing parking options throughout the resort area—are designed to dramatically improve parking and traffic flow. The new parking structure is expected to significantly speed up guest arrival by providing a 60 percent increase in the number of access lanes and by adding parking capacity on the west side of the resort. In addition, the tram boarding area will be reconfigured to enhance the transportation experience for guests parking at both the new structure and Mickey & Friends. Stay on top of all the latest at Disneyland Resort — follow us on Twitter, Facebook and Instagram!